Not only are we capable of designing for manufacturability and creating complex parts in one process, but here's a taste of other things we can do. 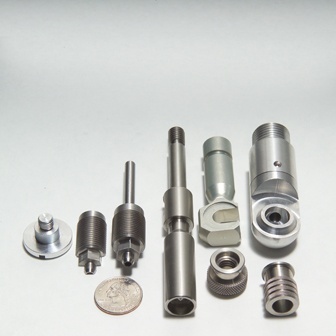 Hover over each image to read more about what each part is, and then contact us today to see how we can help you with your next precision machining project. Pictured is a 6061 T6 Aluminum enclosure built on one of our state-of-the-art vertical machining centers. 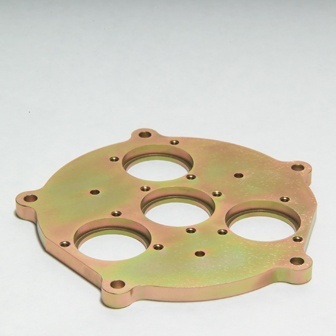 It has a Yellow Chromate plating on it that we supplied so the part could be shipped to our customer complete. It is approximately 2” x 2 ½” x 3 ½”. 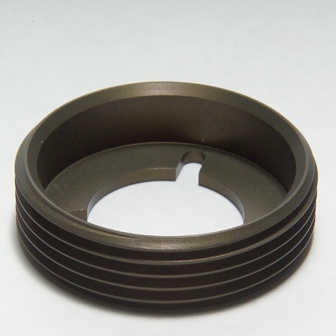 This is a valve end cap produced on one of our CNC Mills. 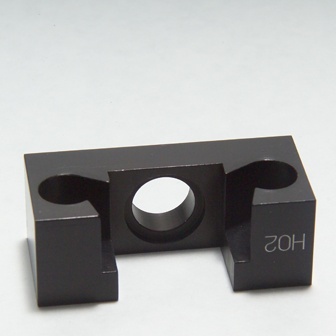 This part was produced from Low Carbon Steel and has a Zinc coating. It is approximately 6” in diameter. 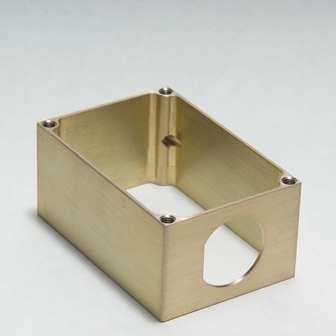 The part shown is a very tight tolerance Brass part produced on one of our CNC Milling Machines. This part features 3D profiling which is challenging given this parts size. It is approximately ¾” x 1 ¼” x 2”. This Assembly utilizes many different manufacturing methods. 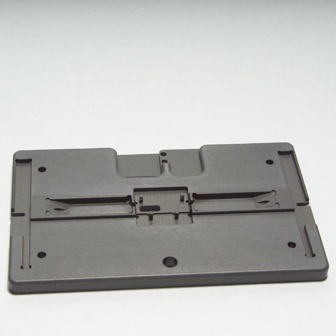 The hard coated black portions were made from 6061 Aluminum on our CNC Mills. The other components were made from Stainless Steel on our Swiss Screw Machines. After all of the parts were produced and plated we assembled and shipped them in a custom container to our customer. These small 7075 T6 Aluminum parts were produced in our Quick Turn department. 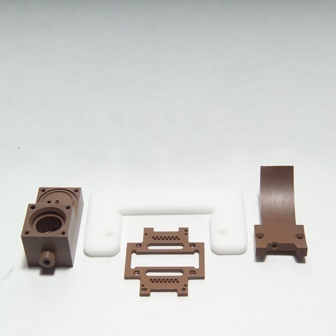 These parts have very tight tolerances and specific surface finish requirements. After clear anodizing, these parts were inspected and shipped with a certificate of conformance. They are approximately 1” cubed. This is a factory replacement blued trigger guard. This Steel part was a replacement for an Aluminum model. Our customer sold this as a more durable alternative. This lightweight Aluminum mounting bracket utilizes a completely machined surface for good looks and strength. This was produced on one of our high speed Mills. It is approximately 3” x 4” x 7”. Made from Aluminum off our CNC Vertical Mill, this Black Anodized fixture component was engraved after machining for extra visibility. 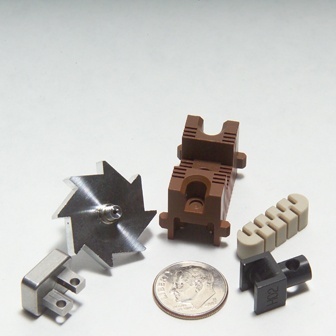 These Small parts were made in our CNC Machining Centers. They can be produced from PEEK, Stainless Steel, Aluminum, Delrin® and others. 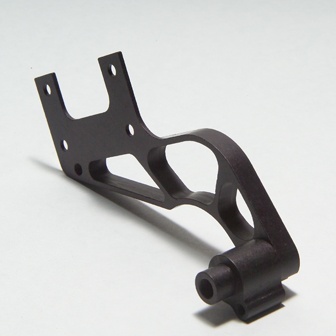 Engineering Grade Plastics are machined on our CNC Mills and Lathes. 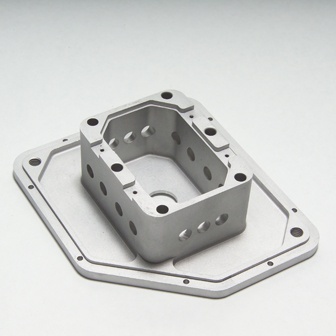 This Aluminum housing is supplied to one of our Aerospace customers. With the touch probe capabilities of our CNC Mills this part can be inspected right on the machine. 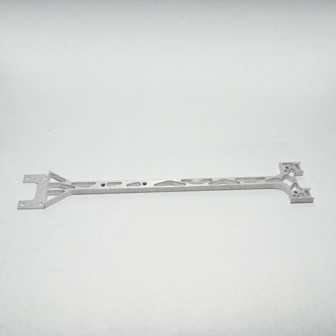 This is an Aluminum assembly fixture plate supplied to one of our Medical customers. 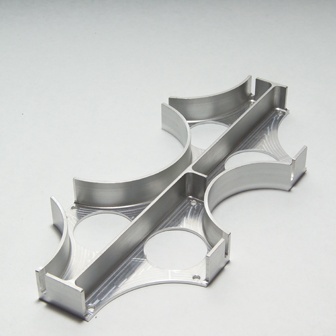 3D profile milling can be a cost effective way to remove mass and add structural integrity to a part. 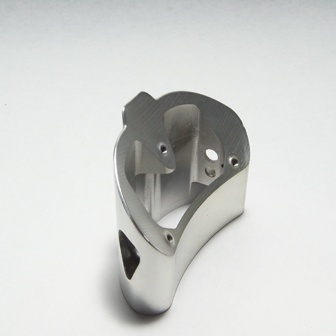 This part was produced for one of our Aerospace customers out of Aluminum. This is a lightweight Aluminum strut produced for one of our high end Commercial customers. 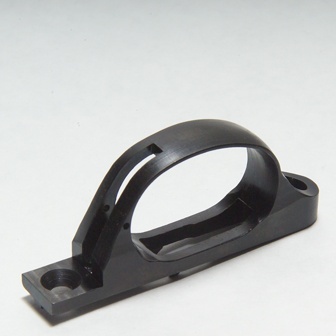 This part is completely CNC Machined for light weight and strength. 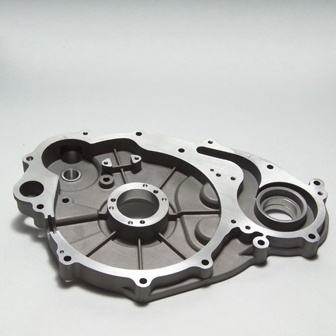 Machined castings are common to us. This motor end housing is machined from Cast Aluminum. 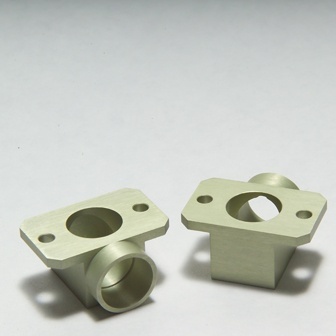 We have machined many Stainless Steel castings too. Larger “Hog outs” are not a problem for us. With high speed spindles and through the tool coolant we can produce these parts with ease. 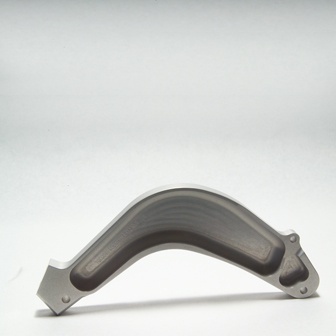 This part was produced on our High Speed Machining Centers. This is supplied to one of our Aircraft customers. 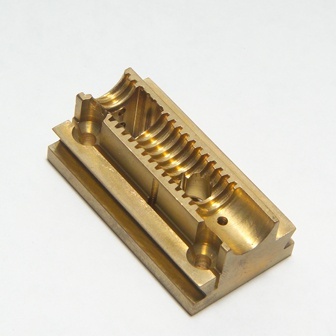 This part was produced on one of our 20mm Swiss screw machines. 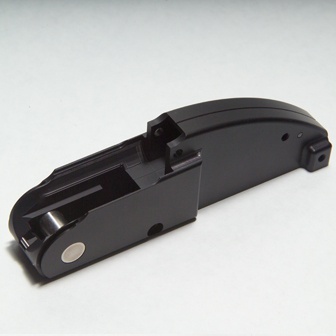 This low Carbon Steel part features offset milling done completely on one machine. It is approximately ¾” in diameter. This collection of small parts is produced on our Swiss Screw Machines. All of these parts were produced with no secondary operations needed. 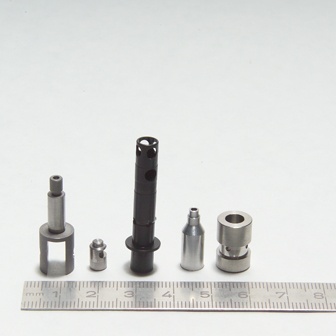 These very small parts are made on our Swiss Screw Machines for the Medical and Aerospace Industries. 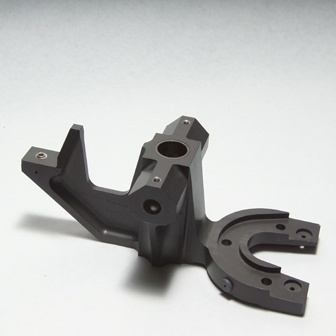 While Forging or Casting tooling is being completed parts like this can be completed for qualification or for bridge production to keep your project on schedule.